ANNAPOLIS, MD – The Governor’s Office of the Deaf and Hard of Hearing today hosted the nation’s first Deaf Business Summit: “Deaf Ecosystem: Maryland’s Open for Business.” It was the first time that a governor has hosted an event exclusively for Deaf and hard of hearing business owners, supporting and encouraging entrepreneurship among the Deaf and hard of hearing business community. Held at the Governor’s Coordinating Offices in Crownsville, the event allowed Deaf and hard of hearing business owners to connect with key state entities, learn about different aspects of business ownership and enterprise available in Maryland, and network with state officials and programs. Public and private experts on small business conducted six workshops throughout the day on various topics including procedures and resources on licensing, leasing, procurement, and financing for small businesses in Maryland. Three keynote speakers provided remarks, including Lt. Governor Rutherford at the summit’s luncheon, Small Business Ombudsman Randall Nixon, and Kelby Brick, director of the Governor’s Office of the Deaf and Hard of Hearing. The summit closed with a business reception, featuring hors d’oeuvres and dessert provided by Deaf and hard of hearing chefs from Maryland. “By empowering small, deaf-owned businesses, revitalizing Maryland’s economy, and bringing more jobs to the state, Maryland is better able to tackle the pervasive unemployment and underemployment that many Deaf and hard of hearing individuals experience,” said Director Brick. 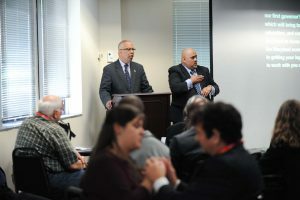 The Deaf Business Summit came just before the first Maryland Governor’s Business Summit, which will take place on May 18 in Baltimore. For more information about the Governor’s Business Summit or to register, please visit: https://marylandbusinesssummit.com/. The Governor’s Office of the Deaf & Hard of Hearing serves as a coordinating office that advises the governor on issues related to the Deaf and hard of hearing population. The office advocates for and promotes the general welfare of Deaf and hard of hearing individuals in Maryland by addressing policy gaps, providing expertise related to Deaf and hard of hearing issues, and facilitating access to resources and services. Lt. Governor Boyd K. Rutherford shares his remarks with Deaf and hard of hearing business owners, emphasizing Maryland’s commitment to the Deaf Ecosystem.